Forbes Senior Editor David Ewalt shows how the first RPG in history has had a permanent and lasting impact on not only gaming, but our culture as a whole. Of all the games created in the last century, Dungeons & Dragons has arguably had the most impact. It spawned a generation of individuals who sought out a world different from our own, and created one of the first recognizable nerd subcultures of the modern day. With over thirty million active fans, it's hard to argue that the game hasn't had an impact on our geek culture. Though D&D players are often demonized as hopeless nerds, the fact that most people are aware of that reputation goes to show the depth at which the game has become engrained in our culture. 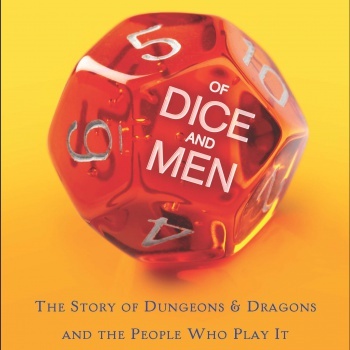 In his brand new book, Of Dice and Men, David Ewalt explains the importance of this impact, as well as the history of Dungeons & Dragons and how the game has defined a generation of RPGs, and our increasingly global culture. Of Dice and Men delves into the game's origins and history, exploring the historical influences for the game, as well as the history of the game itself, including the mid-80's panic over the game's relationship with Satanic rituals and teen suicide. Ewalt digs deeper than simply cataloguing the game's history, though. He explores how D&D has permanently changed the way that people think about games, and how the game's impact could be greater than anyone might have anticipated. The book is currently available in hard and softcover, as well as digital e-book. Clearly a man who understands his audience, Ewalt has also included a limited time offer in which consumers who order multiple copies of the hardcover version of the book will receive special rewards, including a D&D module written by Ewalt, a digital copy of the Adventurer Conqueror King System (a classic-style RPG), or even a privately run D&D game for up to ten players. The book is on sale for $16.00 in hardcover, or just $10.00 for a digital copy. The offer expires at 11:59 on August 22nd, so if this sounds like your kind of deal, make sure to act quickly.